Joseph Hewes born in 1730. Image courtesy of the North Carolina Office of Archives and History, Raleigh, NC. 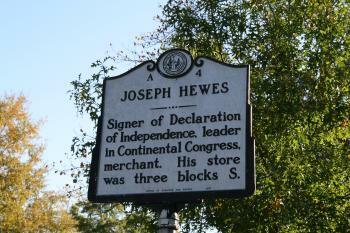 Although Joseph Hewes was a native of New Jersey, he was one of three North Carolinians to sign the Declaration of Independence. His business experience, education and honorable character enabled the Tar Heel to serve North Carolina vigilantly in public service for thirteen years. Born in 1730 Hewes grew up near Kingston, New Jersey. His parents, Aaron and Providence Hewes, belonged to the Society of Friends and moved from Connecticut to New Jersey to escape religious prejudice. In New Jersey, Hewes received his classical education from Princeton College. He then moved to Philadelphia to pursue business and acquire more merchant and trade-related knowledge. Serving as an apprentice to the successful merchant and importer, Joseph Ogden, Hewes learned much, and this knowledge combined with his work ethic contributed to his financial success. After the apprenticeship concluded, Hewes became a successful, independent merchant. Hewes’s success was not unusual. The burgeoning merchant class, and their increasing wealth, prompted England to pass numerous tax laws. Among North Carolinians, Hewes had an honorable reputation. Through his reputation Hewes gained the respect and trust of his neighbors and fellow North Carolinains. This ultimately led to his election and success as a representative for North Carolina. After living in New York, Philadelphia, and New Jersey, a thirty-year-old Hewes moved to Edenton, North Carolina. Even though he was practically a stranger in the town, he soon acquired a reputation as a distinguished and honorable man of agreeable demeanor and generous hospitalities. His prosperity as a merchant continued in North Carolina and led to a growing approval from his neighbors, who in turn selected Hewes to represent them at the Colonial Legislature of the province. He held this distinction from 1766-1775, which resulted in his growing popularity among constituents. In 1775 he also served as a Member of the Committee of Correspondence of the new Provincial Assembly. 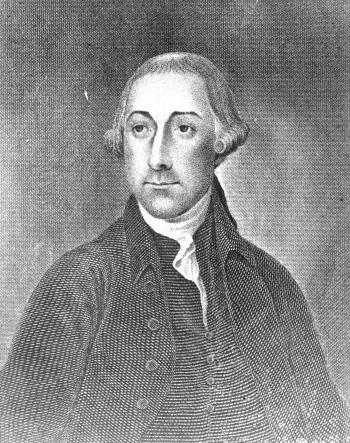 Hewes instantly became an influential member of the Patriot cause, especially when he was appointed to one of two committees at the Continental Congress. In 1774 North Carolina sent three delegates, including Hewes, to the Continental Congress. The original goals of this Congress were to restore harmony between American colonies and Great Britain, obtain redress of grievances suffered by the colonies, and peacefully obtain and secure the unalienable rights of the colonies. Two committees were appointed during this Congress, one of which Hewes served on. In this committee the members focused on general state rights that had been violated and the best course of action to take to restore them. Hewes helped prepare the report that included ten declarations of rights, an enumeration of wrongs already committed against the states, and a conclusion in which the committee stated their desire to pursue three peaceable measures. North Carolinians were pleased with Hewes’s representation and elected him to Congress for a second time in 1775. He stayed until its adjournment in July. He continued to serve the state of North Carolina, almost entirely uninterrupted, for the next four years. His final appearance in Congress came on October 29, 1779. Hewes struggled with an illness for sometime and remained confined in his chamber from October until his death on November 10, 1779. His funeral took place the following day. Congress, the General Assembly of Pennsylvania, the President and Supreme Executive Council, the Minister Plenipotentiary of France, and a number of citizens came to pay their respects to a great man who dedicated so many years to the Patriot cause. To honor the memory of Hewes, members of Congress wore a crape around their left arms for one month. Hewes did not have any children to leave his inheritance to due to the sudden death of his bride-to-be in 1766. William Brown and Charles Peters, Biography of the Signers to the Declaration of Independence. John Sanders and Robert Waln, eds. Vol. 5. (Philadelphia Press, 1828); John Frost, Lives of American Merchants: Eminent for Integrity, Enterprise, and Public Spirit. (Saxton and Miles, 1846); Robert W. Lincoln, Lives of the Presidents of the United States: With Biographical Notices of the Signers of the Declaration of Independence. (Published by Edward Kearny, 1842); Willis P. Whichard, Justice James Iredell. (Carolina Academic Press, 2000).